Football season’s less than a month away so now’s the time to get ready! If you don’t have a satellite dish kit for your RV, why not? 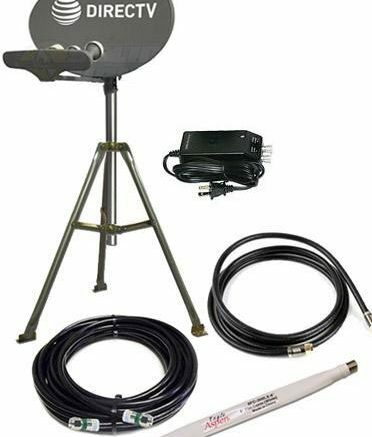 Solid Signal has the ultimate starter kit for tailgaters available NOW. This is the only kit at its price that will let you watch NFL Sunday Ticket in high definition. Our RV Satellite Kit includes everything but the receiver and that means the dish, tripod, cable, even the power inserter for the SWM module! You’ll definitely want to shop now because setting up a dish takes practice. Most experienced tailgaters can get an HD dish up and running in under 45 minutes, but the first time it’s going to take you a lot longer than that. You don’t want that first experienced to be ruined, so make sure you get the kit nice and early and give yourself plenty of time to get it right. The RV Satellite Kit is a great value, and if you’re going to get a lot of use out of it, you might consider also getting a SATLOOKLITE meter. It’s not cheap, but it’s a lot less expensive than other alternatives. You can use the built-in meters in the receiver but they’re a lot slower than a purpose-built meter like the SATLOOKLITE. In most cases you won’t be able to get away with one of those inexpensive satellite finders, so make the investment to the right tool now. Get ready for the kickoff and more importantly, get ready to make your friends jealous!